I need to explain the very interesting geology of both the Four Aces claim and Happy Jack Mine. The floor of White Canyon is the highly fossiliferous Brushy Basin white limestone of the late Cretacious Morrison Formation. It creates a mile or more wide almost horizontal platform with narrow canyons eroded deep into this floor. 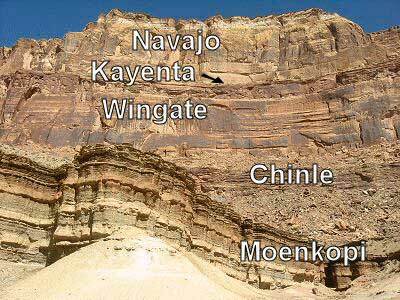 The Moenkoepi Formation is widespread throughout the southwest USA. It is a red, brown to purple (particularly in White Canyon, Utah) 200 to 350 foot thick very fine grained sandstone which erodes into nearly vertical cliffs at the edges of the flat white platform. It was deposited in the early Triassic under a shallow sea some distance from shore ending about 240 million years ago. At that time the sea withdrew and the surface of the formation was dry land but almost level. Meandering streams, and tropical swamps developed with heavy cover of tree vegetation. After a geologically brief time the sea returned and Chinle shale began to be deposited far off shore reaching a depth of up to 1000 feet in our area. Theodore learning to operate a cat, in the evening, July, 1955. The cliff is Wingate Sandstone and it is named Copper Point because of the late 19th Century Four Aces copper mine just below it. The soft formation sloping up from the cat parking place to the Wingate is Chinle shale. It is the shale of the Painted Desert and the Petrified Forest National Parks. Note the cat built, switch back road up to the base of the Wingate. As the sea began to return at the beginning of Chinle time, the shallow, meandering river channels filled in with coarse gravel, small rocks and lots of wood. This forms the discontinuous gray Shinarump Conglomerate Formation. At the top of the Moenkopi cliffs these filled stream beds appear as gray lens shaped outcrops about 50 to 90 feet deep and 100 to 250 feet wide. The very thick soft Chinle shale erodes into a not very steep slope gaining depth from its lower edge at the Moenkopi-Shinarump cliff top up to the bottom of the much taller bright red vertical cliffs of Wingate aeolean (wind deposited) sandstone. The substantial wood debris in the Shinarump adsorbed both copper and uranium, the two main minerals in the water. It is easy to spot the Shinarump as gray lens shaped outcrops cut into the top of the vertical Moenkoepi cliffs under the gradually sloping Chinle shale. Any prospector would find such outcrops interesting. Copper ore is also easy to see because it is brightly colored blue or green. Thus in the 1890s, prospectors identified most of the Shinarump outcrops as rich copper mines. Several were worked for a year or two yielding rich ore. However, the expense of getting the ore to smelters (via mule train to the Colorado River, one way raft to another mule train down river) destroyed any hope of profit, so none of the mines lasted long. Most of these mines had become a patented claim and thus remained legal properties forever. The Happy Jack Mine and the Four Aces Mine (about seven miles apart along White Canyon) were two of the copper mines which had substantial mine tunnels into the Shinarump. I believe both were worked mainly in 1893. The yellow uranium ore is also easily recognized, but before the 1940s the main use of uranium was to color glass purple, and a tiny amount supplied this small industry. This picture is NOT near White Canyon but it shows the formations which are seen throughout the southwest including White Canyon. The Navajo sandstone at the top of this picture is all eroded away at Copper Point, but the very top of the point is Kayenta sandstone , while the main cliff is Wingate sandstone. The Chinle shale formation is much thicker at White Canyon. Except for being colored purple near Copper Point, the Moenkopi looks just the same. Now the geological origin of the Happy Jack and Four Aces claims were identical and their 19th Century development was exactly parallel with similar very rich copper deposits. So our company geologist, my friend Richard V. Gaines, had every reason to assume that they would contain the same amount of uranium. Unfortunately it turned out that water had somehow gotten into our Four Aces Shinarump formation thousands (possibly millions) of years earlier. Uranium ore is more soluble than copper ore, so the uranium had been leached out leaving the copper largely behind. Since Exploration Incorporated was looking for ten million dollar mines, and after spending a bit over $100,000 a month we had found only a few million dollars of uranium, it sold the lease. Some other company mined out the Four Aces property so there was nothing left of what I remembered when I visited with my children years later. 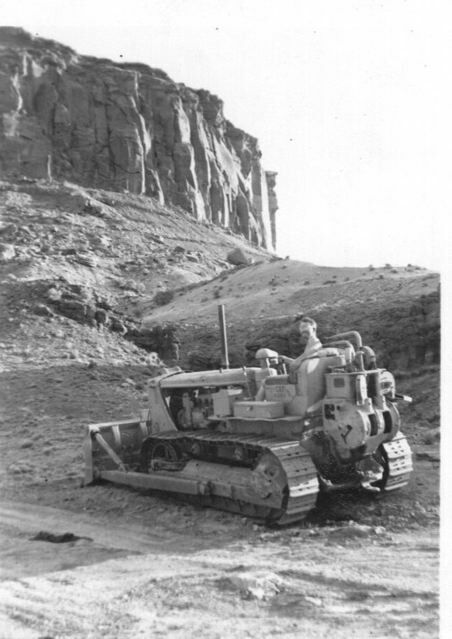 With this preparation I will have more 1955 mining stories soon.